To view the video please click below. We recommend viewing it in Full screen mode using 1080p (HD) quality. This series of video tutorials is one of the fastest way to learn Xomega. Start by watching the first video, and then select other videos that you are interested in. You can also jump to individual topics within a video, in case you paused it while watching, or if you would like to review that topic again. Benefits of Model Driven Development. Creating an ASP.NET solution with basic views. 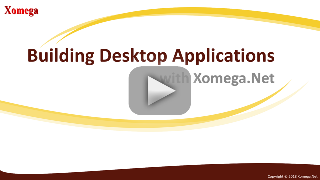 Adding a WPF desktop client to an existing Xomega solution. 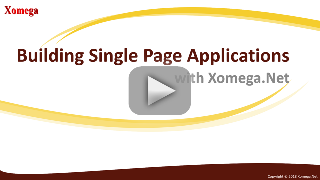 Building a secure client-server WPF application with Xomega. Exposing service layer as a WCF middle tier. Securing WCF services in multi-tier desktop applications. Comparison of Xomega architectures for ASP.NET, WPF and SPA. Exposing service layer as a secure REST API. Adding a SPA web client to an existing Xomega solution. Implementing security for a SPA client. Adding custom TypeScript code to a Xomega SPA client. 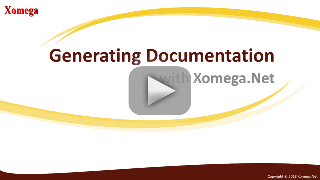 Generating Domain Model Design documents with Xomega. Static data and generation of Static Data Design documents. Generating Service Model Design with custom style and static content. Customizing dynamic content in document templates. Generating data-driven MS Word reports with Xomega.